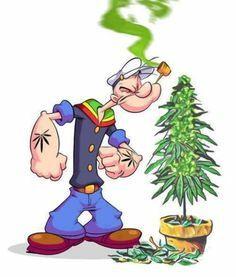 "Popeye, look! That ship capsized in the harbor with everyone aboard!" "Well, blow me down, Olive!" "Popeye, can you yank the anchor chain and pull the ship to shore?" I'm Popeye, the Sailor Man BOOP! BOOP! "But, Popeye, you didn't eat your spinach!" "Oh, that was just product placement, Olive. I gots paid plenty by the Spinach Growers of America for that." "Then, Popeye, where does the strength come from?" "I thought you wouldda guessed by now, Olive." "I Yam What I Yam and That's All What I Yam! And don't Bogart that pipe, Olive." With this annoying little entry in the weekly Friday Fictioneers' Sweepstakes based on the picture prompt above, I'm counting on most people remembering Popeye the Sailor Man (BOOP! BOOP!). He hasn't been on TV in any of his three incarnations (One black & white, two in color, & one in which the character of "Bluto" is oddly named "Brutus") in many a year. If you don't remember Popeye, Olive, and the rest, never fear. The other Friday Fictioneers are ready to blow you down with their takes on the picture prompt, most of which in no way include product placement by the Spinach Growers of America. But I hope you like the Popeye piece. And I will gladly pay you Friday for a nice comment today. Didn't expect a Popeye story ....Wonder what fuels Popeye. I think that's been asked and answered in this post! Well fueled, he is. Love it. Loved Popeye as a kid and to find it was just product placement is too funny for words. What an ingenious take, Perry. 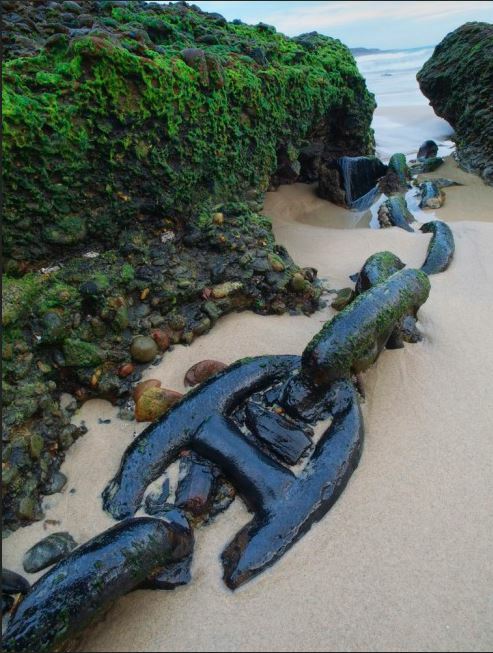 Of course, Popeye can handle this chain. No problemo! I'm going to eat some spinach now. Nice one! Once I saw a lady who looked exactly like Olive at a restaurant in Niagara - had her picture too! Guess Popeye was from a generation past! Thanks, Irene. It really got crazy in the last series of Popeye cartoons when they had him eating spinach souffle in four star restaurants before punching out Bluto (or Brutus). Oh, Popeye can handle the chain no sweat, but now we know why he kept talking about the origins of chains, and how they make chains, and how much he loves chains, and why we should love chains .. I'll eats me spinach, thank you. I do remember Popeye, Olive, Brutus, Swee'Pea. Sigh. He's still a chemical dependent, regardless what's in his pipe. Spinach might earn him less jail time, though. They have a big Spinach Festival in Alma, Arkansas every year. Popeye always shows (a paid endorsement, of course). I don't know if they have a Miss Olive Oyl contest or not. As Robin Williams once said while playing Popeye, "sounds like some kind of lubricant to me." I heard Whimpy moved to Havertown and now bums Philly Cheesesteak sandwiches instead of hamburgers. By the way, that bowler hat looks nice on you. Popeye! One of my favorite fellows. Always new there was something besides tobacco in that pipe. And you were right. You just can't smoke spinach. Thanks! Popeye always has the best. Maybe if we get 20 or so of them together, they could lift the couch. Though I'm not sure why they would bother or even give a crap. I though you might remember it, Rochelle. But I doubt there's any truth whatsoever to the rumor you did the original artwork! No, I don't think you were. In the mid-50's features and cartoons that had been shown in the movies suddenly starting cropping up on television --- Popeye, The Three Stooges, Flash Gordon, the Little Rascals, Warner Brothers cartoons, and much more. Kids of that era almost defined themselves by this stuff. I never left the house until I was 17. You ever taste that stuff? Eating spinach is more incomprehensible than smoking dope. Doubt they'd let him loose without extensive observation. The only problem is that guys keep throwing bowling balls at my head. They say it's an accident, but too many lousy bowlers seem to be getting strikes between my ears. As for the Spinach Festival, please cover it for me, okay, Russell?l . There isn't even any tobacco. Stick around. I'll have Queen Elizabeth smoking dope. Who would have guessed... btw is this a product placement from Colorado? How'd you know, Bjorn? I finally got through to them! Will do, Perry. And if I run into any of those hot Olive Oyl contestants with a figure like a broom handle, I'll be sure and give them your contact information. I guess this is a case of you can put it in your pipe and smoke it, too. Oh, if the the originators of Popeye could just read this now, they'd be turning over in their spinach- covered watery graves. I'm sure. There go all my illusions. I always thought spinach made you strong. Now I'll have to try this other, uh, vegetable instead? And they'd be laughing just like Curly Howard too, apparently! Thanks, Randy. Wait up, I'll try some with you! I liked it very much. And as to the universality of Popeye, it's great to see the "Boop! Boop! "is the same in any language! Thanks! Popeye didn't laugh like that? Wait. Let me take another hit on my pipe first. You're just into boops, Betty Block, aren't you! Yes, I'm into big BOOPs, the bigger the better! BOOOPPP! I always thought it was Wimpy. He was always hungry and he never had any money. Faked me out, they did. I thought I wrote a comment here - but I guess it went up in smoke! I thought you did too, but maybe my memories went up in smoke as well. BTW, my son is in Israel now as part of a Birthright trip and he's staying on another week. Hope spinach is his only homage to Popeye there. Well, blow me down! Thanks, Sarah. Gods! That took me back to when my kids were little. Wait a minute! That took me back to when I was little. What's going on here? I think I started eating spinach as a kid because of Popeye. Boop! Boop! Great product placement there Perry. I think that the violence in the old cartoons and shorts like the Three Stooges was so exaggerated and obviously false that kids didn't take them seriously. Today's blood -stained movies are another thing. I never had spinach in a can but I'm sure it wasn't pleasant. Thanks. Unfortunately Popeye got paid for it, not me.